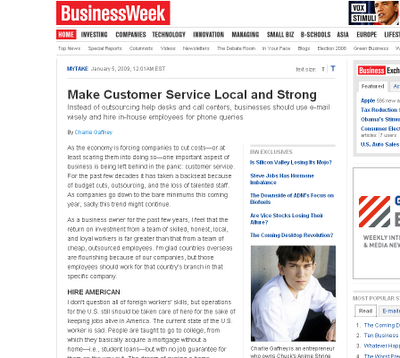 For the second time I once again grace the front page of BusinessWeek's website. 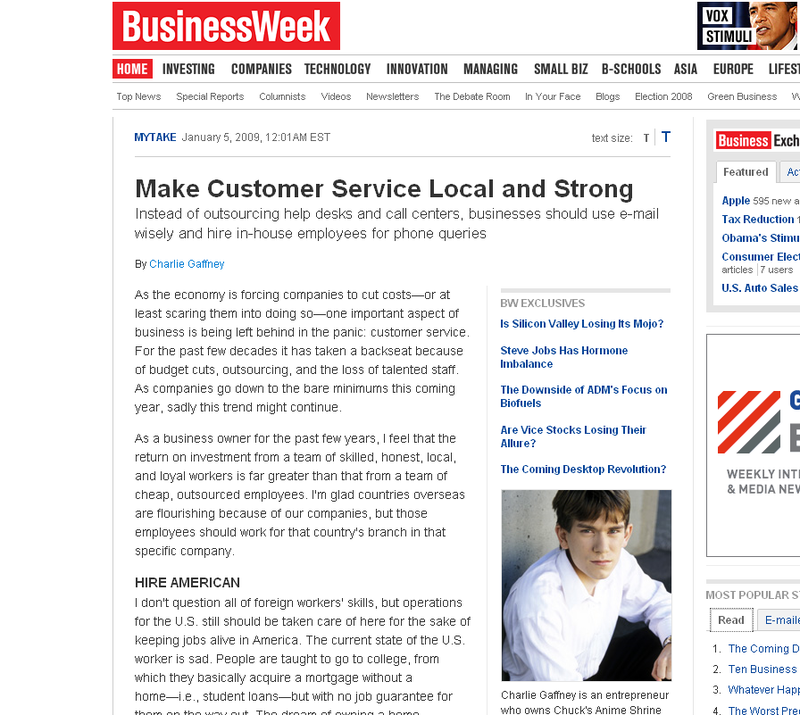 This time, instead of poking fun at Secretary of Treasury Paulson, I got my own article up there. The article might not be anything of use for my fellow anime fans but in it I talk about how email is the number one form of communication between me and my customers, which is usually fellow otaku. Business has been getting rather busy but even so, I'm not answering phone calls like a maniac as seen in my day-job or in many other businesses. Granted, the anime fan demographic is that of people who are in this century and who would use email instead of a phone to answer simple questions. Basically, we all know jobs could and should be kept here in the US (for those of us living in the US). I know many people, anime fans or not would love job opportunities to open up if major companies just keep their international staff internationally. Anyways, check up on the article if you'd like. i agree. e-mail is a simple and fast way to communicate. it's free and sometimes it's easier to describe in written words. but it does has it pros and cons as well. pros to the customers since it's so easy to send an e-mail to ask any question. cons to whoever needs to answer them cos as a company grows, e-mails tends to sky rocket as well. soon u will find yourself wasting time answering simple questions over and over again. some people just love to ask questions without looking at the FAQs first where most common questions are answered. anyway good luck to your business. all the best in 2009! Man well done once again. Email is indeed a better and more economical as well as ecological form of communication. It is relatively way faster, easier to type out something, and can be saved for future reference if need be. Thanks Panther and Gordon ^_^ I'm definitely starting to see it now Gordon. Emails are starting to pile up but as we know if I let the phones loose I'd be on the phone all day and get much less done.